Summit is proud to announce 3 of its advisors have made Forbes magazine's best-in-state wealth advisor list for their respective states! Check out financial tips and insight on our blog! At Summit Wealth Group, we understand that individuals face unique challenges as they prepare for retirement. We can help take the mystery out of preparing for today and tomorrow. Whether your goal is preparing for retirement, college savings, or estate strategy, our personalized service focuses on your needs, wants, and financial goals and objectives. Providing comprehensive, fee-based financial planning and advisory services to individuals and business owners for over 33 years! 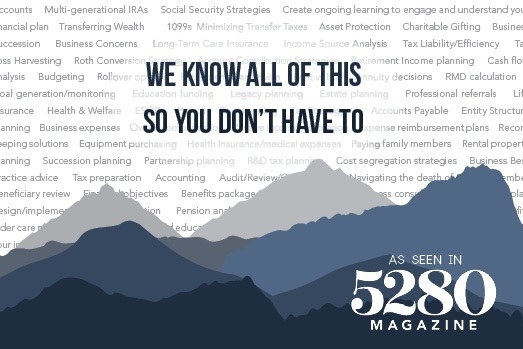 We are a team of financial advisors, CFPs®, CPAs, planners and administrative professionals headquartered in Colorado Springs, CO, with branch offices located around the country. We provide the level of care and attention as your neighborhood family advisory, but with the resources of a large firm. With a passion for serving our clients, and deep conviction of helping you navigate the path to a better, more secure future, we are known for our team-based approached to financial planning. When you sign on with Summit Wealth Group, you are not just dealing with one financial advisor like other firms, you are joining an overall client experience provided by an entire team of individuals all working together to serve YOU. We are fee-based which means we sit on the same side of the table as you. We are focused on your success and use our history in the industry which dates back over 30 years, along with our team of experts to provide a truly customized, comprehensive financial planning and wealth management experience. When it comes to creating an investment strategy, it is important to realize that every person has unique, deeply personal objectives, goals, expectations, and risk levels. We believe there is no “one size fits all” when building an investment strategy. As a courtesy to you, a link to a short risk-based questionnaire is provided below. Once completed, we will carefully evaluate your results and contact you for a complimentary consultation. Our goal is to provide insight regarding your current strategy, determine if it meets risk objectives, as well as evaluate if it is constructed properly to meet your short, mid or long-term goals.